The Island Hopping Tour is designed to be active, but not in a demanding way. We move at our own pace- kayaking in the crystal clear Adriatic Sea, snorkeling into underwater caves, hiking along old goat trails to a hilltop fortress, and biking alongside olive groves & vineyards. We are constantly charmed and mesmerized by the old customs, layers of history, and small island life. Meals, in small family owned restaurants on the islands, are a highlight. Seafood is freshly caught; produce is locally grown; and Croatian beers and wines are excellent. Island Hopping is suitable for families and novice paddlers, but also flexible enough to accommodate experienced kayakers. Trip Length: 8 days/7 nights, Friday to Friday. Days 1 & 8 are transit days, without scheduled activity. Accommodations: Island guest house rooms with private bathrooms, towels and linens, refrigerators, and A/C. Guesthouses are chosen for their character, friendly owners, and easy access to the sea, village restaurants, shops, and kayak base. Full Meal Plan*: 9200 Kn / €1235 / US$1420 / £1100 Full meal option includes dinner all 7 nights. Meal option does not have to be chosen in advance. Our most popular tour begins in Dubrovnik, the “Pearl of the Adriatic“. Stari Grad (Old Town), perhaps the best preserved Medieval city in the world, is Croatia's biggest tourist draw. Old Town, completely encircled by towering stone walls, is now a crowded and chaotic destination. We happily board a 4 PM 1960s era ferry to the Elaﬁti Islands. The Elaﬁti Islands are a group of 13 islands north of Dubrovnik, a quiet little oasis of untouched nature. Only three of the islands are inhabited. Our base for the week is Lopud, the middle of the three inhabited islands. The 50-minute ferry ride immediately gives you a feeling of open space and tranquility, surrounded by the calm, blue Adriatic Sea and views of the mountainous coastline and green islands. The small village of Lopud, the only village on the island, is a charming town without roads and cars, with a year-round population of roughly 150 inhabitants. The pace of town life follows nature- it awakens just like nature in springtime, in early April, when our tours begin. Lopud was inhabited from ancient times. Through the centuries it has acquired an interesting combination of old stone houses, palm tree parks, and 15th century aristocratic mansions surrounded by orchards of olive, lemon, orange, and kiwi trees. There are many small stone chapels, two general stores, and 10-12 restaurants, ranging from pizza to fancy seafood. Lopud town is set in a wide bay. A 15-century monastery with a stone defense system dominates the northeast entrance to the bay. The ruins of an ancient fort, Utvrda Sutvarac, sit on top of one of Lopud's two main hills; an 11th century chapel on the other hilltop. Our guesthouse rooms are located in stone guesthouses near the walking promenade that runs the length of the U-shaped bay, with easy access to small shops, cafes, ice cream stands, and swimming spots. Meals are a tour highlight: long and leisurely in lovely outdoor settings with views of the sea and nearby islands. Seafood is local and freshly caught; produce is organic and likely grown on the island; dairy and packaged products arrive daily by ferry. Postira, the local ferry, is a focal point of life on the island. Locals swarm to the pier to meet incoming ferries to unload baskets of fresh bread, cases of beer and wine, and packaged goods. Dinners rotate among the 10 plus restaurants on the island. Lunches are at small family owned restaurants while kayaking. Lopud is the perfect base for kayaking and exploring the Elaﬁti Islands. We take in the island's relaxed way of life and old traditional customs. We explore ancient ruins and feast on fresh seafood and home-grown garden delights. Our surroundings for the week: the brilliant, blue sea and the island's pristine nature of limestone cliffs, citrus and olive groves, and pine forests. Arrive in Dubrovnik / airport transfers. Explore Old City independently / 4 PM ferry to Lopud Island. Explore Lopud town/ swim/ orientation dinner at an island restaurant. Equipment issue & basic paddling and rescue instruction in Lopud Bay/ paddle the outer side of Lopud along limestone cliffs to Šunj beach/ lunch at Šunj beach bar. Optional paddle to St. Andrew's Island, weather permitting, or hike to the Byzantine hilltop fort. Leave kayaks at Šunj/ walk back to town. Morning hike to kayaks at Šunj/ kayak from Šunj beach to Koločep Island. Circumnavigate Koločep/ paddle along towering cliffs and into caves/ snorkel into Blue cave/ lunch at a wonderful seaside restaurant on Koločep/ return to Šunj. Kayak from Šunj to Trsteno on the mainland coast/ walk through Trstenoʼs well preserved 15th century arboretum and Versailles-like gardens (also a film site for "Game of Thrones"). Lunch at Trsteno's only restaurant/ return paddle to Lopud. Paddle from Lopud to Šipan Island/ swap kayaks for bicycles to cycle from Suđurađ village across the island to Luka Šipanska, a charming village in a deep bay with views north of the outer Elafiti Islands. Lunch at seaside restaurant in Luka/ return to Lopud via bicycle and kayak. Dinner at an island restaurant. Kayak to Šipan Island, this time to paddle into Šipan's Arch cave and and swim in Green Cave. The Arch cave, carved by exposure to the sea and wind, is dramatic, set in towering limestone cliffs. Green cave, on the inland side, is the opposite, a small opening barely discernable. Swim and snorkel into Green Cave/ cliff jump into the sea/ lunch in a family home in Suđurađ. Go to the beach/ ferry to Dubrovnik to sight see/ kayak or hike on your own/ farewell dinner at an island restaurant. Early morning ferry to Dubrovnik/ transfer to the airport for departure ﬂights. * The "free day" is purposely placed at the end of the week so kayaks may be used independently, or it may be moved to another day to take advantage of the most favorable weather and sea conditions for paddling. 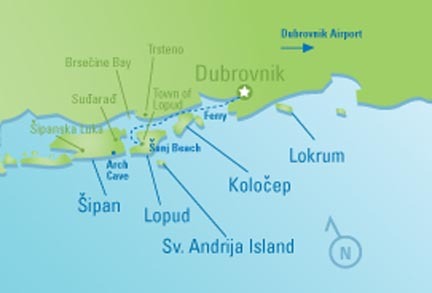 ** The early ferry departs Lopud at 6:20, arriving in Dubrovnik at 7:10. You may make a departure flight at 9 am or later. You may opt for a later ferry, 12:10 pm, if you don't have immediate onward travel plans.